Charles Cornwallis, første marki Cornwallis (født 31. desember 1738 på Grosvenor Square i London, død 5. oktober 1805 i Ghazipur i Uttar Pradesh i India) var en britisk kommandant og koloniguvernør. I USA huskes han mest som general i den amerikanske uavhengighetskrigen. Hans nederlag i 1781 for en samlet amerikansk–fransk styrke i beleiringen av Yorktown regnes vanligvis som slutten på krigen. 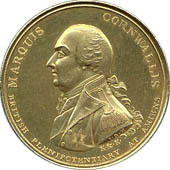 Han etterfulgte sin far i 1762 som den sjette baron Cornwallis og den andre jarl Cornwallis og ble selv utnevnt til marki i 1792. Cornwallis var eldste sønn av Charles Cornwallis, 5. Baron Cornwallis. Hans far ble i 1753 elevert til Earl Cornwallis. Moren var niese til den første britiske statsminister, Robert Walpole. Broren var admiral William Cornwallis, onkelen Frederick Cornwallis erkebiskop av Canterbury. Cornwallis gikk på Eton College, og gikk i 1757 i inn i 1. Foot Guards. Under syvårskrigen (1756-1763) tjenestegjorde han i Tyskland og steg i gradene til oberstløytnant. Som politiker i whigpartiet motsatte han seg blant annet beskatningen av de amerikanske kolonier. [trenger referanse] Han falt imidlertid aldri i unåde hos George III av Storbritannia, men ble tvert i mot i 1775 utnevnt til generalmajor. På William Pitts innstendige ønske lot Cornwallis seg i 1786 utnevne til generalguvernør i Ostindia,[trenger referanse] der han med hell kjempet mot Tipu Sultan 1790-92 og tvang ham til å avstå en stor del av sitt område. Han medvirket deretter i unionen mellom Storbritannia og Irland i 1800, men la ned sine embeter i Irland i 1801 da kongen nektet å samtykke til en forbedring av katolikkenes stilling på øya. I årene 1801-1802 var Cornwallis britisk fullmektig ved fredsforhandlingene i Amiens, og 1805 ble han for andre gang generalguvernør i Ostindia, men døde der allerede i oktober samme år. Av hans Correspondence utkom andre opplag i 1859. Bicheno H. (2003). Rebels and Redcoats: The American Revolutionary War. London. Borick, Carl P. (2003). A Gallant Defense: the Siege of Charleston, 1780. Columbia, SC: University of South Carolina Press. ISBN 978-1-57003-487-9. OCLC 50511391. Buchanan, J (1997). The Road to Guilford Courthouse: The American Revolution and the Carolinas. New York. Carrington, Henry Beebe (1876). «Battles of the American Revolution, 1775–1781». New York: A. S. Barnes. OCLC 33205321. Duffy, Christopher (1985). Frederick the Great: A Military Life. London. Dupont, Jerry (2001). «The Common Law Abroad: Constitutional and Legal Legacy of the British Empire». Littleton, CO: Wm. S. Hein. ISBN 978-0-8377-3125-4. OCLC 44016553. Ferling, John (1988). The World Turned Upside Down: The American Victory in the War of Independence. London. Fewer, Michael (2007). The Wicklow Military Road: History and Topography. Dublin: Ashfield Press. ISBN 978-1-901658-66-8. Fischer, David Hackett (2004). Washington's Crossing. New York: Oxford University Press. ISBN 0-19-517034-2. Fortescue, John William (1902). A History of the British army, Volume 3. New York: Macmillan. Greene, Jerome (2005). The Guns of Independence: The Siege of Yorktown, 1781. New York: Savas Beatie. ISBN 1-932714-05-7. OCLC 60642656. Harvey, R (2001). A Few Bloody Noses: The American War of Independence. London. Harvey, R (2007). War of Wars: The Epic Struggle Between Britain and France 1789-1815. London. Johnston, Henry Phelps (1881). «The Yorktown Campaign and the Surrender of Cornwallis, 1781». New York: Harper & Bros. OCLC 426009. Lecky, William Edward Hartpole (1892). «A History of Ireland in the Eighteenth Century». London: Longmans, Green. ISBN 978-1-4021-6724-9. OCLC 312999699. Mill, James; Wilson, Horace Hayman (1858). «The History of British India, Volume 5». London: Piper, Stephenson, and Spence. OCLC 3019507. Pancake, John (1985). This Destructive War. University, AL: University of Alabama Press. ISBN 0-8173-0191-7. Piecuch, Jim (2006). The Battle of Camden: a Documentary History. Charleston, SC: The History Press. ISBN 978-1-59629-144-7. OCLC 70219827. Rohatgi, Pauline; Parlett, Graham (2009). «Indian Life and Landscape by Western Artists: Beginnings – The English East India Company». Chhatrapati Shivaji Maharaj Vastu Sangrahalaya. Arkivert fra originalen 29. juni 2010. Besøkt 23. august 2010. Sen, Sailendra Nath (1994). Anglo–Maratha Relations, 1785–96. Delhi: Popular Prakashan. OCLC 1406688. Unger, H.G (2002). Lafayette. New York. Weintraub, Stanley (2005). Iron Tears, Rebellion in America 1775–1783. London. ISBN 978-0-7432-2687-5. Wickwire, Franklin and Mary (1980). Cornwallis: The Imperial Years. Chapel Hill: University of North Carolina Press. ISBN 0-8078-1387-7. Wilbur, Marguerite Eyer (1945). The East India Company and the British Empire in the Far East. New York: R. Smith. OCLC 186486927. Whelpton, John (2005). A history of Nepal. Cambridge, UK: Cambridge University Press. ISBN 978-0-521-80470-7. OCLC 55502658. Denne siden ble sist redigert 16. jul. 2018 kl. 04:43.